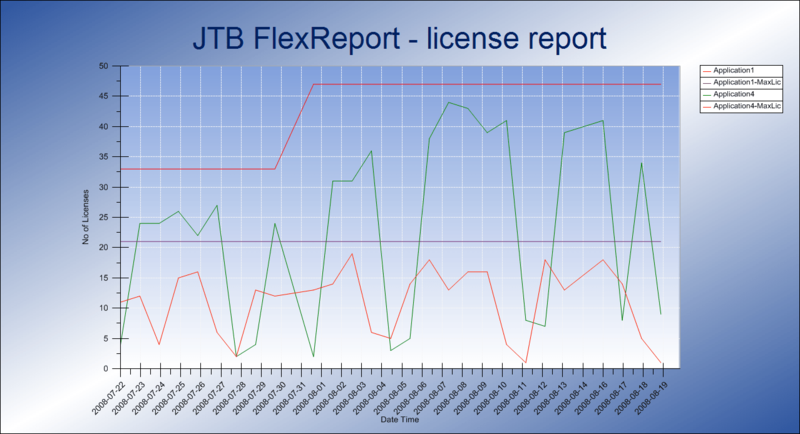 Finally JTB FlexReport 6 is released. Network license monitoring (FLEXlm/FlexNet/IBM LUM/12D/SPLM or most any other application usage monitoring and reporting on is made easy. It will be useful when deciding if and when to add more licenses or to cut back on the number of licenses you have at your company. 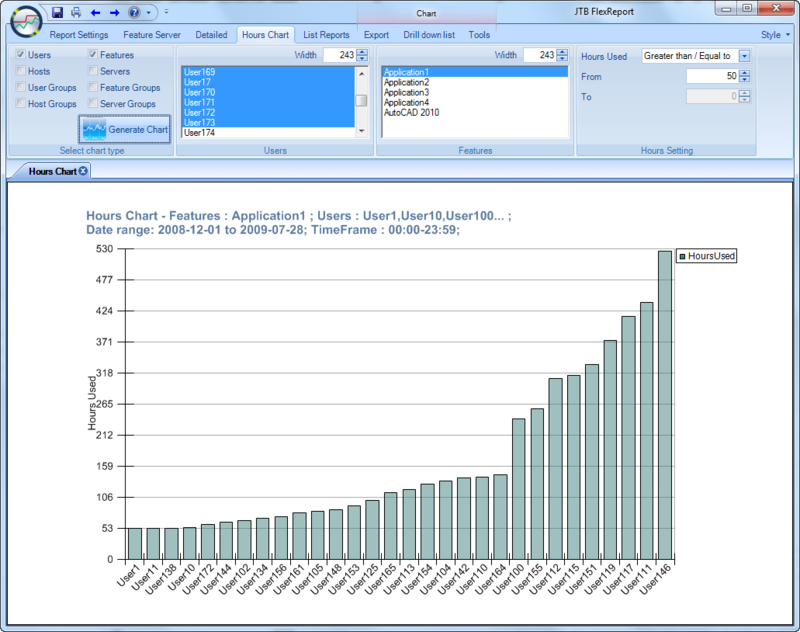 Many make use of JTB FlexReport to help splitting license and maintenance costs among their users or groups of users. Chart report on how many hours users have been using a feature. The hours chart now support many different combinations to create the chart you want to see as well as the ability to filter for example if you only want to see hours greater/equal than specified amount. 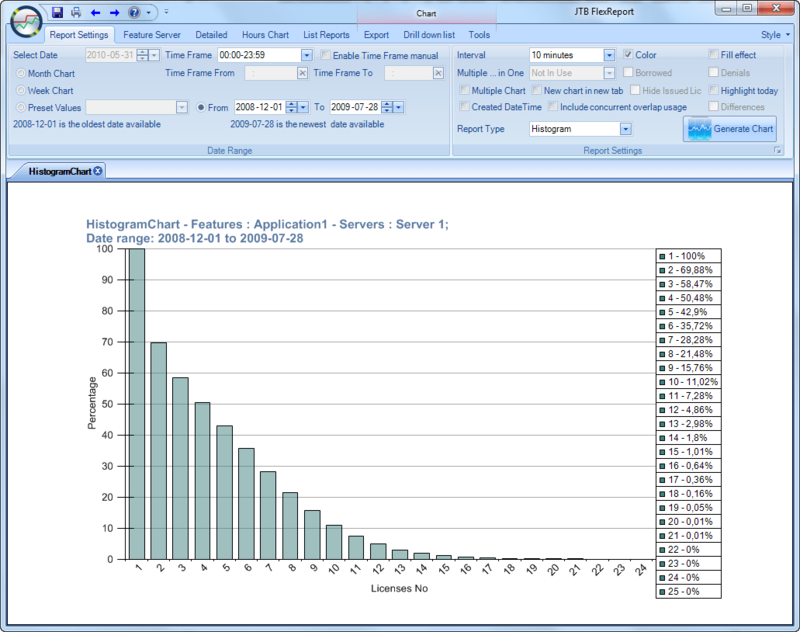 Histogram Chart that can help to determine if you need more or less licenses. Downloads and documentation are found at the JTB FlexReport site. Uninstall previous installations first before installing this new version. Now work is started on JTB FlexReport 6.1 that will include a better application to administrate groups of user, hosts, feature and servers without the need of Access. Grouping of usage based on IP ranges. 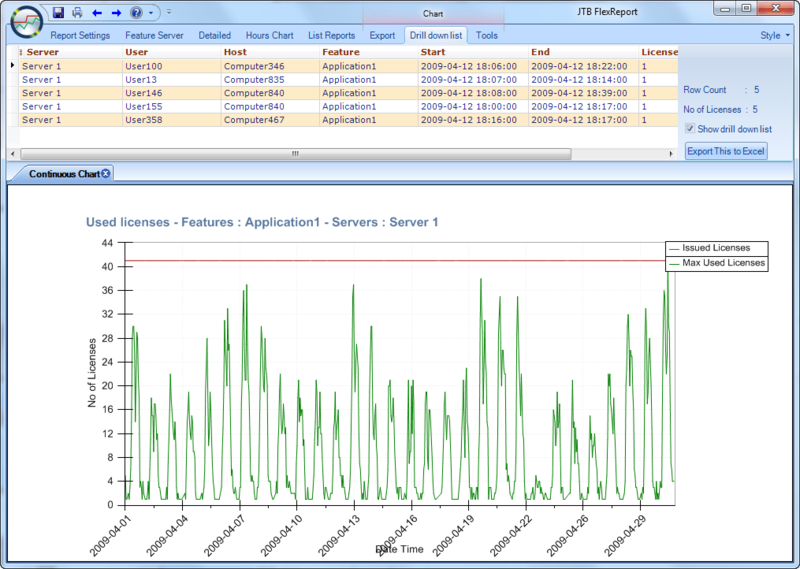 Support for SafeNet's Sentinel License Monitor (SLM). Improvements on other things and probably some bug fixes. First post using Windows Live Writer 14.0.8117.416. Hope some of the bugs that annoy me are fixed. So I’ll be using this while waiting for the new big Windows Live Wave 4 release that hopefully comes soon with a new update of WLW. For solutions and forums see the Live Writer Portal. Only problem I found was that I got it in Swedish when I wanted it in English. But that was solved by changing the order in Language Preferences in Internet Explorer > Internet Options > Language Preference. What is the solution if AutoCAD 2011 hangs at startup? If you try to start AutoCAD 2011 and it hangs and becomes unresponsive the solution might be to that the Autodesk InfoCenter file C:\Program Files\Common Files\Autodesk Shared\WSCommCntr\lib\WSCommCntr2.exe is still running. AutoCAD starts to the point that you can see the application UI, command line, Properties and so on. This happened to me right now so I though I should share the solution. If you just kill the WSCommCntr2.exe process in Windows Task Manager AutoCAD becomes responsive again and you can start using it. No need to kill the acad.exe process. How to fix a broken Ribbon? It can certainly be a pain with such a problem in AutoCAD and it doesn’t heal by waiting like when a rib is fractured. If you find yourself in a situation where you see the text “The Ribbon does not have any tabs or panels currently loaded.” and don’t know how to restore the Ribbon and menus here are some tips. It might be because you have done some customization in a wrong way to accidentally deleted all workspaces or messed up something else. I’ll try to come up with a solution here. The easiest method is to click on the black down arrow and click on Workspace. Then select one of the workspaces from the Workspace dropdown. Run the command WSCURRENT and you might find that it has an empty value. This indicates that something is wrong. try first to use Restore ACAD.CUIX and if that does not work try Reset ACAD.CUIX. Now this is what it look like when there are Workspaces but none current. Right click on any of the Workspaces and select Set Current. If the Ribbon still is missing run the RIBBON command. If Express Tools menu is missing run the EXPRESSTOOLS command. If the Ribbon is missing next time you start AutoCAD you probably need to show it again and then save the workspace using WSSETTINGS command. See also Restore lost workspace, menus and profile in AutoCAD Architecture. Feel free to leave a comment with your favorite remedy. How to find the layer of a block that is nested? This was a question I got. This can be useful if the entities in the blocks are on layer 0 and you really want the layer the nested block is inserted on but not the parent block. The key is to use nentsel. Here is from the help about nentsel. The nentsel function prompts the user to select an object. The current Object Snap mode is ignored unless the user specifically requests it. To provide additional support at the Command prompt, nentsel honors keywords defined by a previous call to initget. A string to be displayed as a prompt. If the msg argument is omitted, the Select Object prompt is issued. When the selected object is not complex (that is, not a 3D polyline or block), nentsel returns the same information as entsel. However, if the selected object is a 3D polyline, nentsel returns a list containing the name of the subentity (vertex) and the pick point. This is similar to the list returned by entsel, except that the name of the selected vertex is returned instead of the polyline header. The nentsel function always returns the starting vertex of the selected 3D polyline segment. Picking the third segment of the polyline, for example, returns the third vertex. The Seqend subentity is never returned by nentsel for a 3D polyline. Note: A lightweight polyline (lwpolyline entity) is defined in the drawing database as a single entity; it does not contain subentities. Selecting an attribute within a block reference returns the name of the attribute and the pick point. When the selected object is a component of a block reference other than an attribute, nentsel returns a list containing four elements. The first element of the list returned from picking an object within a block is the selected entity's name. The second element is a list containing the coordinates of the point used to pick the object. The third element is called the Model to World Transformation Matrix. It is a list consisting of four sublists, each of which contains a set of coordinates. This matrix can be used to transform the entity definition data points from an internal coordinate system called the Model Coordinate System (MCS), to the World Coordinate System (WCS). The insertion point of the block that contains the selected entity defines the origin of the MCS. The orientation of the UCS when the block is created determines the direction of the MCS axes. Note: nentsel is the only AutoLISP function that uses a matrix of this type; the nentselp function returns a matrix similar to those used by other AutoLISP and ObjectARX functions. The fourth element is a list containing the entity name of the block that contains the selected object. If the selected object is in a nested block (a block within a block), the list also contains the entity names of all blocks in which the selected object is nested, starting with the innermost block and continuing outward until the name of the block that was inserted in the drawing is reported. For information about converting MCS coordinates to WCS, see the Entity Context and Coordinate Transform Data topic in Using AutoLISP to Manipulate AutoCAD Objects in the AutoLISP Developer's Guide. Draw a 3D polyline with multiple line segments; then load and run the following function and select different segments of the line. Pick off the line and then pick the same segments again to see the subentity handle. Try it with a lightweight polyline to see the difference. (print (strcat "Entity handle is: "
(print (strcat "Entity or subEntity handle is: "
I have got Excel reports from Share-it that I had no problem to open before. Now when I use Excel 2010 I just cannot open them. Excel found unreadable content in 'document.xls'. Do you want to recover the contents of this workbook? If you trust the source of this workbook, click Yes. If I click on Yes I get this message. Excel was able to open the file by repairing or removing the unreadable content. Excel recovered your formulas and cell values, but some data may have been lost. But still after that the spreadsheet is empty just three sheets named UnknownSheet1, UnknownSheet2 and UnknownSheet3. Seems to be a bug in Excel 2010 version 14.0.4760.1000 (32-bit). If you know the solution or if I find it I will update this blog post. Update: Share-it has fixed the problem on their end so files created by them now work. Now it’s up to Microsoft to fix so that these files can be opened in Excel 2010 as they can be opened in earlier versions. This is great news as it makes it possible to make add-in programs for example for AutoCAD 64-bit to access MS Access databases. Among JTB World’s software I plan on implementing this for ACAD_db and ACA_db. If there is a need for it JTB FlexReport could be supported as a native 64-bit application and still have the option to support MS Access databases, not sure if there is any pressing need for it though. Formerly known as Office Connectivity Component, Access Database Engine 2010 is now available in both 32-bit and 64-bit. It is available in 9 languages. You can download it here. This download will install a set of components that can be used by non-Microsoft Office applications to read data from and write data to Office 2010 system files such as Microsoft Access 2010 (mdb and accdb) files and Microsoft Excel 2010 (xls, xlsx, and xlsb) files. If you are connecting to Microsoft Office Excel data, add “Excel 14.0” to the Extended Properties of the OLEDB connection string. Work is progressing with Autodesk’s Project Butterfly that I was covering in a previous blog post about Project Butterfly. At that time, the technology preview was just entering the Autodesk Labs’ sandbox. Project Butterfly allow you to edit AutoCAD DWG files in the web browser as well as review and co-edit them with others. Could this eventually be a Autodesk Design Review killer as there definitely is some feature overlap. Autodesk’s cloud offerings are evolving and one of the technology’s enhancement is Google Maps integration. It is very easy and intuitive to use. For more about Project Butterfly check out the teams blog at: http://autodeskbutterfly.wordpress.com that also lists some of the missing features. Recently added are support for complex linetypes, leader styles and improvements to Multiline Text as well as the review crop functionality. Try also the easy to use file sharing. It will be interesting to see if HTML5 will be embraced eventually because now it rely on Adobe Flash Player plug-in to work and thus cannot be used on for example an Ipad. One thing I could see useful for the timeline functionality is to compare drawings between different dates and have them marked up in red/yellow/green like Drawing Compare in AutoCAD Architecture or the compare function in Autodesk Design Review. VBA is having 7 lives it seems. Office 2010 is now available in a pure 64-bit version. How about VBA then? This document mentions that with the introduction of the new 64-bit version of Microsoft Office 2010, a new version of Microsoft Visual Basic for Applications (VBA), known as Microsoft Visual Basic for Applications 7.0 (VBA 7), is being released to work with both 32-bit and 64-bit applications. VBA 7 is a new code base, replacing the earlier version of VBA. VBA 7 exists for both the 32-bit and 64-bit versions of Office 2010. Autodesk is having plans to remove support for VBA in AutoCAD 2012 and have prepared for that by having VBA as an optional installer. Now that Microsoft officially keep supporting VBA will Autodesk follow along and make use of VBA 7? See also Learn how to migrate from VBA to .NET for AutoCAD. Here are some news for AutoCAD Architecture and AutoCAD MEP users. AutoCAD® Architecture 2010 Update 2 includes fixes for AutoCAD 2010 Update 2. AutoCAD® MEP 2010 Update 2 includes fixes for ACA 2010 Update 2 and AutoCAD 2010 Update 2. This hotfix repairs a problem that causes AutoCAD Architecture 2011 and AutoCAD MEP 2011 to crash while trimming entities. The problem is sometimes triggered by other modifications such as Fillet, Chamfer, and Extend. Snagit 10 is now available. All-in-One Capture is a great and convenient feature. See why in this 1:11 minute screencast. The All-in-One input combines the functionality found in the Region, Window, and Scrolling Window inputs and with a useful magnifier and ability to justify the region using the arrow keys. Transparency is finally supported making it possible to get rounded corners showing nicely or transparency of windows forms. Here is a screenshot of Windows Media Player using a special skin. And here is a simple window with rounded corners. One thing that is still missing is support for Windows shadows like this one. The Editor is also updated with: Rich text formatting for text capture, Transparency support, Page Curl Effect, Cut-Out Effect, Custom Trim Effect, Rotating Text boxes, Deleted images go to the Recycle Bin and Screencast.com output. This post has best before date of May 30th, 2010. Autodesk is researching candidates for a possible cross-product scripting language/IDE. What is your preferred language? If you want to make your voice heard on this question and others take the survey for the product you work with. See also Autodesk network license feature codes that is work in progress as I don’t have all 2011 feature codes yet. Looking for great AutoCAD training for yourself or your users? No previous AutoCAD knowledge and experience needed. AutoCAD is an industry standard design and documentation software program that is easy to learn, but complex to master. In this video training CD, expert author Brian Benton guides you through the fundamentals of AutoCAD 2011 and teaches you everything you need to know to be on your way to becoming an fully functioning AutoCAD user. Starting with the basics what AutoCAD can do, Brian quickly brings you up to speed on the interface, and then dives right into applying the basics, and ends each important chapter with a project that reviews everything you have learned in each section. Using this hands on approach allows you to more quickly absorb and apply the material being communicated, increasing your retention and understanding of AutoCAD 2011. By the completion of this 10 hour tutorial, you will be familiar and comfortable with AutoCAD, and capable of drawing, decorating and annotating an AutoCAD project. Also included are work files to allow you to work along side the author, and further understand what he is showing you, step by step. The training consists of 103 mini-lessons. Brian Benton has done a great work putting together this educational material now also for AutoCAD 2011. Check out Brian Benton’s blog CAD-a-Blog as well. If you would be interested in doing a similar training video about Revit please contact me and I can get you in contact with the video producers. This is an affiliated ad blog post but I do recommend this product. I try to avoid random ads like Google ads that I cannot stand behind and control. The Autodesk Assistance Program is designed to help displaced employees in the Architecture, Engineering, Design and Manufacturing industries update their skills and improve their employability in a down economy. The program is valid through January 31st, 2011. For more great free learning resources check out AutoCAD Exchange and Plant Exchange and get answers from Ask the AutoCAD Expert or Ask the Navisworks and Plant Expert. This AutoCAD 2011 Polyline and Spline Editing video describes the direct manipulation functionality for pline and spline editing as well as the enhanced join functionality. SSMPropEditor 4 introduces some real time savers that you now can give a try if you are a user of AutoCAD’s Sheet Set Manager. In the post SSMPropEditor sneak peeks I showed the indexing/renumbering functionality making it possible to renumber all or selected sheets in a sheet set as well as counting the number of sheets and changing the path to the sheet drawing. To use Sheet Indexing select at least one sheet and the property you want to act on. Click on Sheet Indexing button. If you want to index or renumber all sheets it is enough to select just one sheet and then use the All Sheets option. Next make the changes in the dialog box to match your needs. Minimum value length pads with leading zeros to specified minimum length. If you want 001 you set the value to 3. This can for example be useful if you add new sheets in between or move the location of sheets and need all sheets numbered in one series. Imagine having to renumber 100 or more sheets manually using SSM. It takes a lot of time and is a tedious work. Now with a few click this can be done automatically. In addition to new features there have been performance improvements when selecting sheets in the tree view as well as some small bug fixes and UI improvements. It is not advisable to use this beta on production sheet sets. It is recommended that to backup the DST. Or even better take a copy of a DST and try on. SSMPropEditor only edits the actual DST file and not the drawings in the sheet set. Please report any issues found. Contact us with all feedback good and bad. Here is the download for the beta. It is time limited until end of May. To make it possible to keep running any current installation of SSMPropEditor there is no installer. You just create a folder on your PC and extract the files to it. The program to run is SSMPropEditor.exe.